On April 22, hundreds of thousands of people around the world gathered together to champion the role science plays in promoting the common good. COSSA staff gathered with social and behavioral scientists to march down the streets of Washington, DC and share the importance of our sciences in particular in advancing our health, well-being, economies, and safety. 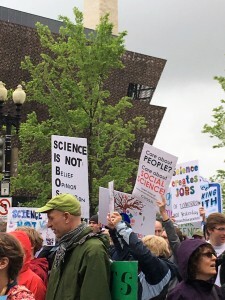 Some of our favorite photos and social media posts from the March are posted on COSSA’s March for Science page, as well as an archive of the many activities and resources organized by COSSA’s member associations. Thanks to everyone who marched in support of the social sciences in Washington and around the world!